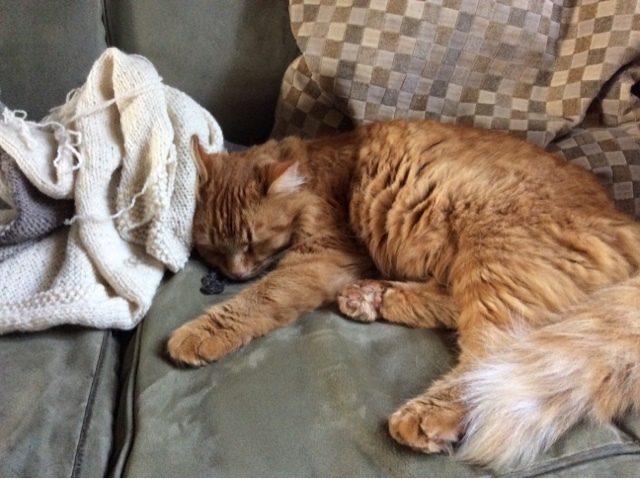 I know I haven't knitted on you in a while, and for that I am truly sorry. It's not your fault. Really. It's just that it's getting so cold out now and even if I did get you finished I probably wouldn't wear you until the spring. It just wouldn't be fair to you, to languish in the sweater bin, looking on hopefully as your thicker, woollier brothers and sisters got taken out and worn with pride. I just can't do that to you. You understand, don't you? No, it's not that your yarn is super thin and it seemed like it took forever to finish the first sleeve. No, I'm not tired of magic looping sleeve number two. I'm actually really looking forward to finishing it. Yes, I know you've heard me grumble under my breath, but I didn't mean it, honest. I love the way the two colours I chose for you are working together. I know I have mentioned once or twice that I'm a little nervous about how the transition between the two colours on the body section might hit me in an unflattering spot, but I swear that it won't stop me from finishing you. 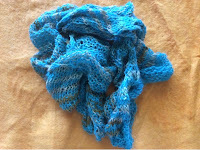 And to be fair, lovely Lace Weight Cardi, I have knitted another one of you. She's Madelinetosh Prairie Lace and to be perfectly forthcoming, she hasn't seen a lot of action outside of the sweater bin, so you see? It all makes sense. I'm perfectly justified in my decision to set you aside. Don't think of this as "goodbye". It most certainly is not. Think of this as "until we meet again", in sunnier days, when the grass is green and the flowers are in bloom and there's just a little chill in the air that makes me think "I really could use a light little lace weight cardigan right about now". Then I will think of you, all beige and dusty pink with that little hit of angora fuzz, just waiting for me to pick you up and finish what we started so many months before. Have faith, Lace Weight Cardi. I will return. Thursday July 16: the day it finally happened. 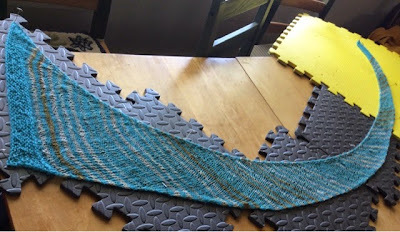 The day I finally finished....the behemoth knit! Actually, it's called "The Chase Is On!" and it's up for sale here on Ravelry in all it's 23" by 66" glory. But not without a fight! It began innocently enough. 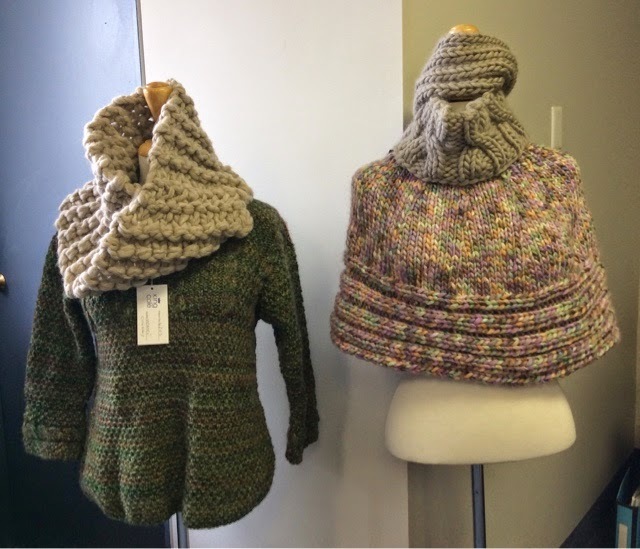 Back in mid-February, the boss chose Estelle Yarns Eco Andean DK Wool as the annual Yarn Challenge yarn. It was terribly fitting, since it is the Year of the Sheep after all. I got unreasonably excited because I had promised myself a 3-colour wrap design using the three colours that were chosen for the Challenge. 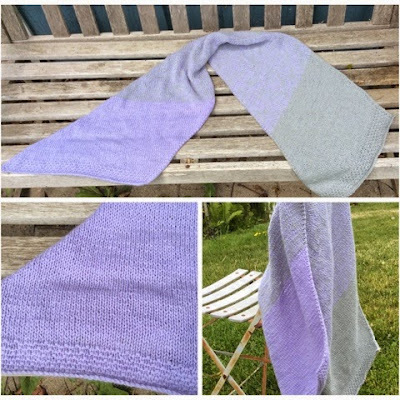 I had fallen madly in love with this yarn ever since Estelle added it to their house brand stable last year and I got to design the Eco Andean DK Brocade Wrap for the free pattern leaflet series. Fate, right? I was realistic about how long it would take. I admitted that there was no way that it would be done in time for the judging, but no matter anyway as I was ineligible to win on account of the fact I'm an employee and all. Come judging week, however, the WIP made guest appearances in the shop window, travelling back and forth in my project bag for a 10-row repeat here and there. Fast forward to the beginning of June. 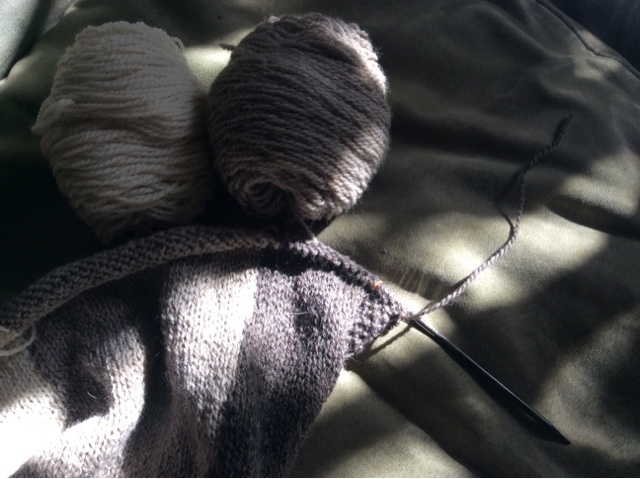 Throw in a lot of soccer for my son, a smattering of new designs for the Fall 2015 Estelle Yarns collection and the mundane routines of life and lo and behold, the behemoth knit is almost done. Just one problem though. I was running out of the dark grey yarn. I did the math, I swear. When I launched into this epic journey I swatched and measured and weighed and measured and weighed again. I told myself that since it was the darker colour, maybe the yardage was short on it because it weighed more - usually true for dyed yarns, but this is a natural colour. Without a solid explanation, I begrudgingly decided to frog back the cast on edge "robbing Peter to pay Paul" as I put it on Facebook in one of my regular behemoth knit updates (actually, you can scroll through many of them here, if you are so inclined). This was a huge pain in the bum because a) ripping out the single moss that provided me with my lovely non-rolling edges is a stitch by stitch proposition and b) I had to frog in multiples of ten rows, but always ending up with an even number of stitches for each colour or the mid-row joins happening in the moss stitch beginning and end sections wouldn't allow for tidy wraps where the colours change. So it wasn't enough to just rip back 10 rows at a time, it had to be 20! You'd think I'd hate moss stitch by now, but you'd be wrong. Then catastrophe number two: I started running out of the white yarn. This was many more times worse than the dark grey yarn scenario. At least if I pulled out a section of it I had lots of yarn to work with because it started out as the bigger wedge on the cast on edge. The white section, being the skinniest at the beginning only yielded 16 stitches worth of yarn per row to add to the cast off edge, which was demanding 54, 55, 56 stitches. I don't know how many repeats I yanked out of the white. I have blocked the entire episode from my mind in order to preserve my sanity. There were pastries and encouragement from the cat. 102 live stitches on both ends. It's a miracle everyone in my family survived. Suffice it to say I eventually had enough white to finish and the actual final knitting of the 10-row borders on each end was a bit of a letdown considering all I'd been through to get to that point. Suddenly I was casting off and done. Blocking and photographing. Rav posting and blogging about the whole sordid mess. After a few very busy weeks and a lot of furious knitting, I can happily offer some new show-and-tell, and with a theme, no less! A while back I was making little colourful piles of yarn at the store when I decided that lace weight, held double-stranded and switching between 2 strands colour A, 1 strand A and 1 strand B then 2 strands B would make an interesting shifty bit of business. I'm not the first one to have this bright idea, in fact I've favourited a great shawl on Ravelry that works just like that and looks really awesome. I've used Naturally Lace for my design, and after an appeal to Tina, I incorporated a cast on and off edge that is unlike my regular go-to moss stitch but still looks just as funky. I used a 4.5mm needle and that, combined with the delightful 60% merino wool/ 40% dehaired angora composition gives this baby a soft and drapey hand that needs to be felt to be appreciated. It's kind of a shawl/scarf hybrid, about 12" wide and about 50" long. 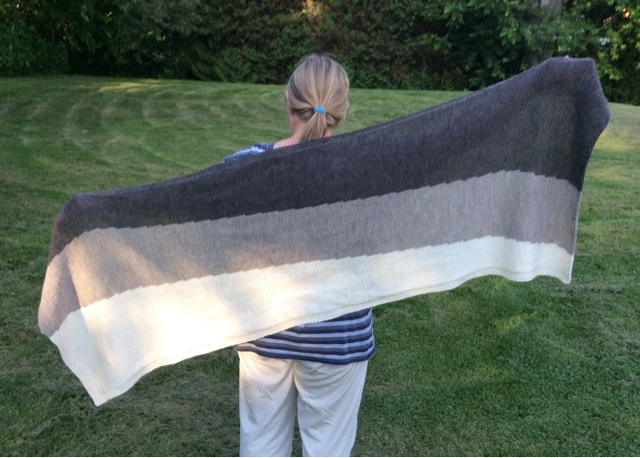 I think I'll give it a bit of blocking before a final photoshoot and its debut on Ravelry in my pattern store. Speaking of blocking, bias knit number two is a skinny summer scarf done in a mix of Berroco Folio and Classic Elite's Bella Lino. There's a whole mess of interesting fibres coming together in this sample: superfine alpaca and rayon in the Folio (pure heaven on its own!) and linen, viscose and cotton in the Bella Lino. 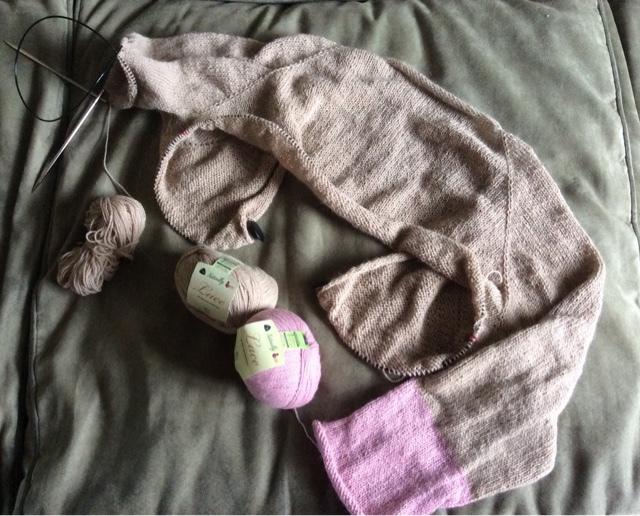 I wanted to try a really long, really gradual wedge-shaped scarf so I started with just a few stitches and threw in some double increases every once and a while to get up to the final width. Blocking helped this one a lot because the mixture of fibres made everything look really uneven (and I hoped the linen blend would soften up a bit with some man-handling). I'm really happy with the result - kind of like when you finish a lace shawl and the thing looks like a hot mess, but a quick soak and some well-placed pins turn it into a masterpiece! There was an added bonus with this design, because when I weighed the yarn remaining on each ball I realized there was enough left to make another version! 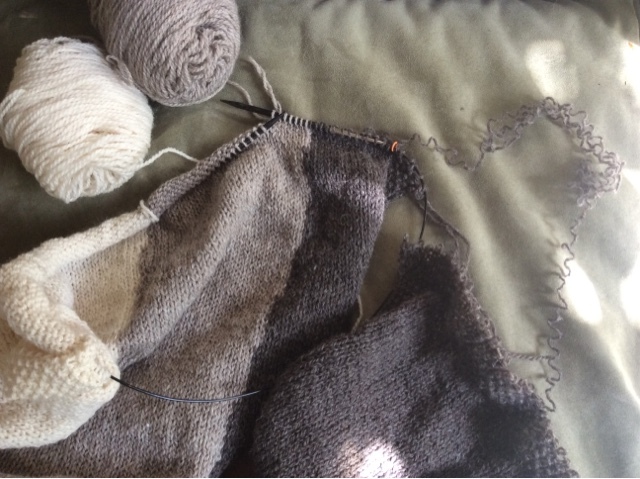 This time I'm starting at the wide end and doing double decreases down to the skinny one, and reversing the order in which the two yarns are used. This pattern is going to be a "two-for-one" deal - stay tuned! Last but not least, a bias knitting project that actually came before the first two, but will most definitely be the last to be released. I recently finished a new design for a poncho and cowl set for Estelle Yarns new yarn called "Union", making its debut at a LYS near you this fall. The poncho is composed of two equal size panels of mostly garter stitch, sewn together to make that classic triangle poncho that seems to be making a comeback recently. 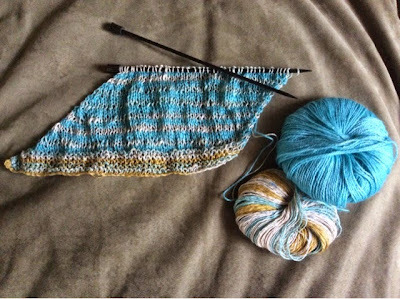 No worries about curling edges here, but I did find knitting all that garter stitch a bit monotonous so I threw in a few stockinette "racing stripes" to break it up, which happily enough, provided me with the name of the design. I finished the poncho and sent it off in time for Estelle's Open House, where they show off all the new yarns for fall, but added the cowl later, dropping it off at the warehouse in time for the final day of the showing. Apparently the poncho was a customer fave - look for it on one of Estelle's free tear-off leaflet pads in the coming months. 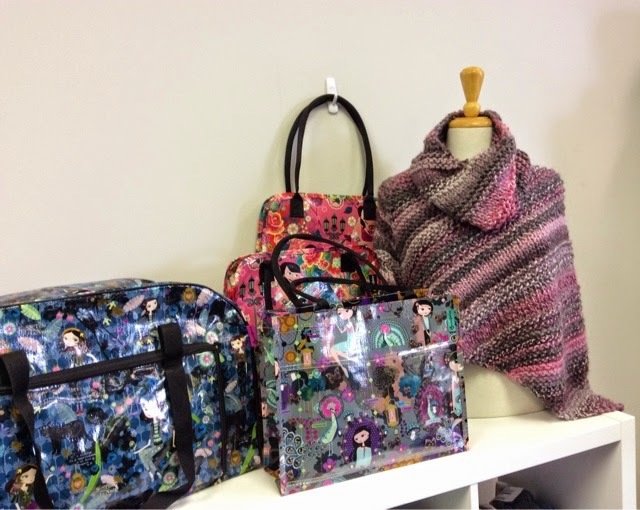 So, three designs, all knit on the bias, all destined for the pattern collection soon. In the meantime, I count seven (eek!) 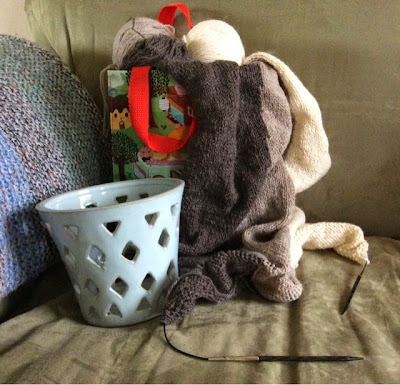 UFOs in the knitting basket (which my ever-understanding husband says doesn't really sound like that many - bless his muggle heart!) so there's plenty more fodder for blog posts to come! Not quite "Knitter's Frolic"...but close! Yes, I know it was the big "Knitter's Frolic" in T.O. this past weekend. I saw all the eye candy in my Facebook feed. I fought down my inclinations towards jealousy and told myself I had dodged a stash enhancing/income diminishing bullet. But I went somewhere instead: the Estelle Yarns Open House. It's where all the people who sell yarn to knitters during the rest of the year when they're not busy buying yarn at places like the "Frolic" go to see what's coming down the yarny pipes for Fall. Yes, I said Fall (with a capital "F") because we all know that summer is coming and a lot of knitting needles are cast aside in favour of garden trowels and the like, and I know it seems blasphemous to hurry the sunny summer weather along to make way for chilly fall, but that's when knitting season ramps back up again and we all need something new to look forward to. 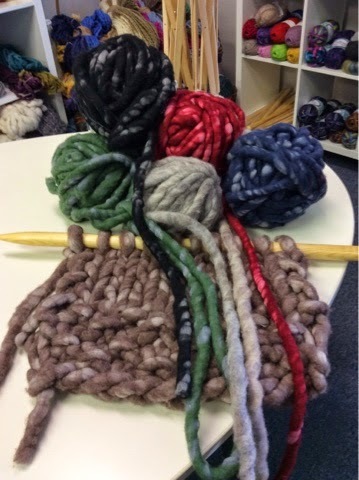 I have the envious position of being a designer for Estelle Yarns, and I get to "meet" and often "test drive" new offerings from them that become a part of their in-house label (or not, sniff!). We all know that samples sell yarn, so I come up with some simple and fun accessory designs that I then knit up as samples which get photographed on Estelle's super-cute model and printed up as the free tear-off pattern sheets available to be torn off at your local LYS. When I arrived the place was humming, but Lynn Cullen, Estelle's Social Media Goddess, greeted me and showed me around the showroom where I got to see many of my new designs on display. 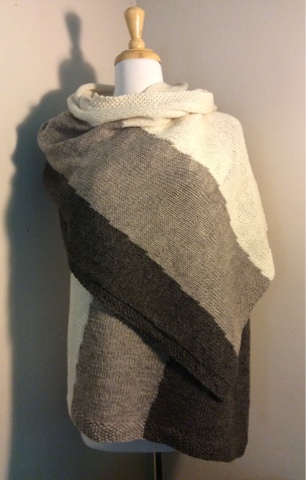 I added a cowl to a poncho design I had just completed for a new Estelle yarn called "Union" (which I was told was very popular with the yarn store owners!). As the crowd thinned, I got a few minutes with Chris Peacock and his brother, John and a hug and a chat with Marsha, Chris's wife (and happily enough, Soper Creek Yarn's sales rep and the person I have to thank for the design opportunity!). I saw some photos of designs I had done earlier this year that were destined for tear-off pattern pads. I became delightfully distracted by a new, super bulky roving-type yarn that required custom gigantic needles. Everyone "ooh-ed" and "aah-ed" over the three-skein Estelle Eco Andean DK monster knit (that yes, I'm still working on!). I capped off my visit with sushi (yes SUSHI! These folks really know how to feed their clients right!) and a cookie, followed by a sniff and snuffle from Charlie Peacock, resident canine (probably because of the aforementioned sushi and cookie residue). 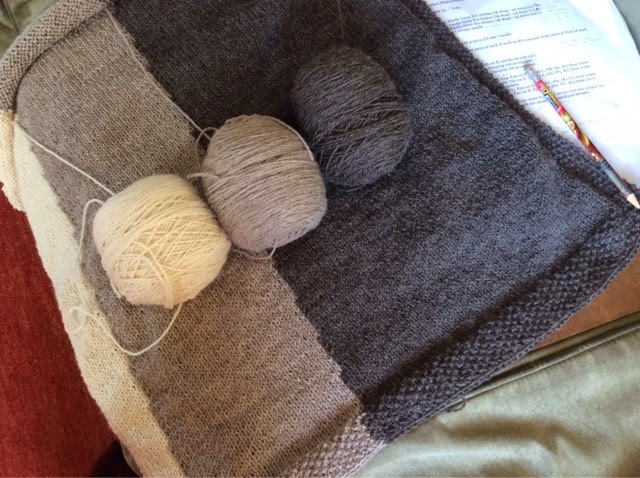 Then I hopped back on the highway and headed for home, with the promise of more design work to come but permission to follow my own knitting muse for a little while. Oh, and on the way home, I stopped in at Homesense. I was keen to look for a little enamelled metal sieve to use as a yarn bowl (Facebook followers may remember my post about crafting "hacks" which led me down the path to sieve procurement!). I was disappointed to discover that apparently the little enamelled metal sieve trend seems to be over, so I came up with a "hack" of my own: witness the glazed clay flower pot (well really a holder for a flower pot, as the saleswoman pointed out, because "how exactly do you water that?" - her words). Its lattice-work cut outs provide ample opportunities to feed yarn through and the glazing coats all the surfaces so I shouldn't have snagging issues. It's a goodly size as well so it should hold a fairly large ball of yarn (though I can't really demonstrate at the moment as I don't have anything new that needs to be "bowled"). This weekend was ridiculously fun! 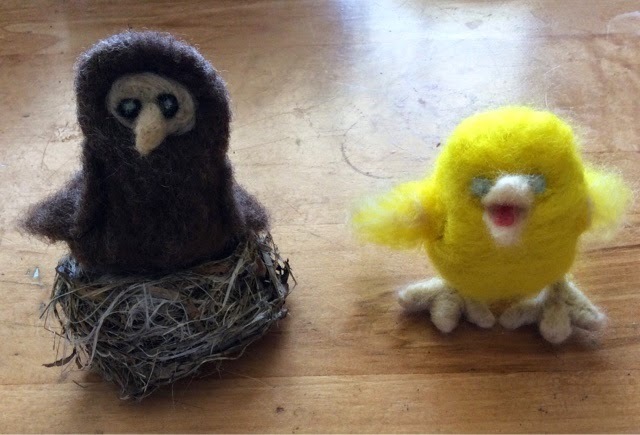 I posted some pics on Facebook about the adventures of Ruben and I at A Gift of Art's Needle Felting workshop, hosted by Michelle Houston of The Wild N Wooly. 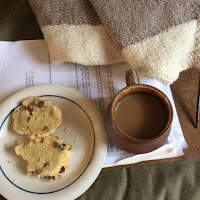 I am absolutely smitten by this craft and am seriously considering converting all the non-superwash fibres in my spinning stash to needle felting materials! The process is so simple and quick and if you make a mistake, just add a little more fluff or yank some off! Wrong colour? Pick it off and start again. When my husband asked: "So, this is all you need? You don't have to buy some big piece of equipment or something?" I was happy to reply "This is it: a few felting needles, some fluff and a sponge. That's all!" So here's a complete "gallery" of my creations, which will be making guest appearances at Soper Creek Yarn for now (because my husband asked me "So, now what are you going to do with these?"). 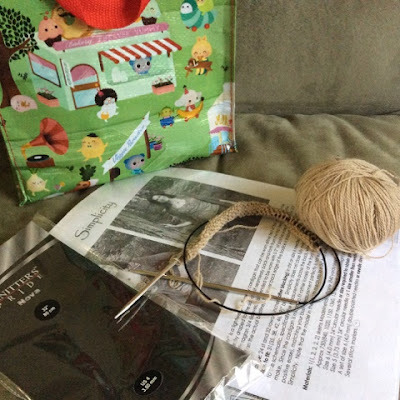 My in-class project was the alpaca (which my husband mistook for a giraffe!) After class, in my enthusiasm I whipped off the beaver and the bright yellow chick, and the next day I hauled out a bunch of my spinning fibres and turned some odds and ends into a cute baby owl and a wicked-looking sheep (the outer layer of the sheep is made from my locally-sourced Cotswold lamb locks!). There's something awesome about being able to use my own fibres in this way because even if they are grubby, stained skirtings from my fleece they still make great felting wools. 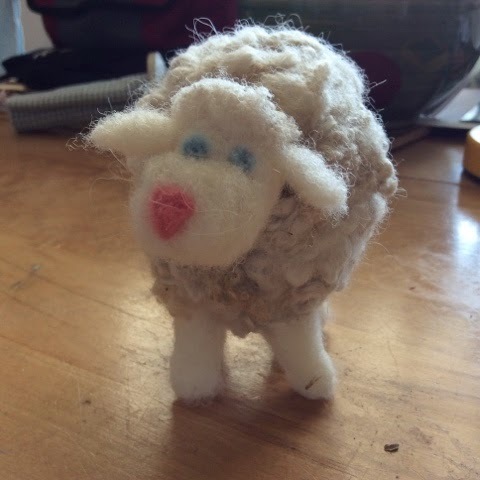 The lightly stained Cotswold lamb locks give my felted sheep an "authentic" look and the really stained fibres worked just fine as the core wool which I used to build up the initial body shape. Since I hate to waste anything when it comes to my fleeces, it seems this craft was made for me. 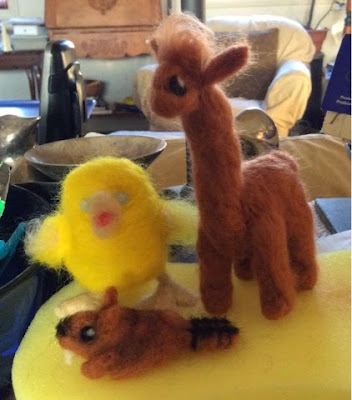 When I heard about needle felting and all the adorable felted critters started showing up in my Pinterest feed I knew I was in trouble. For me, needle felting seems like the perfect compliment to the fibre preparation work I do, which seemed like a perfect compliment to the spinning, which seemed like a perfect compliment to my knitting. Perfectly perfect, right? 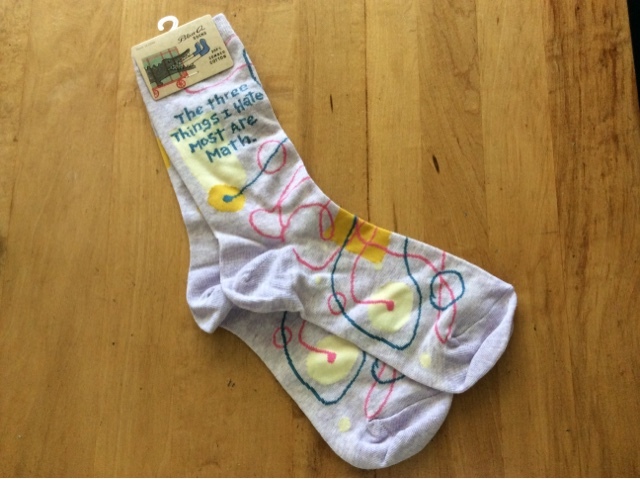 Maybe, but please, don't show me any more cool new fibre crafts (and while we're at it, let's not speak about dyeing wool - at least not around my husband!). 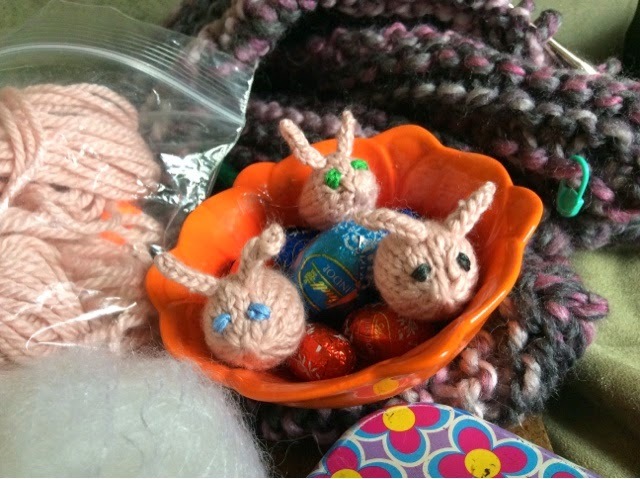 On this long Easter weekend, I was reminded of a super cute pattern for tiny knitted bunnies that my friend Mrs. Ivy found on Ravelry. 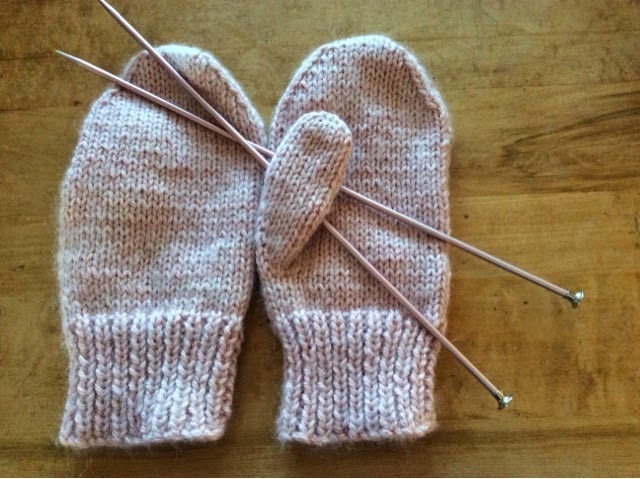 I decided to take a wee bit of time off from the Estelle design work to knit up a few. I quickly discovered that the pattern is courtesy of one of my fave designers, Anna Hrachovec of Mochimochi Land fame. It also occurred to me that the perfect "odds and ends" of yarns required for this endeavor should be the ones that I used recently for my "Pet the Bunny" mitts, namely the super soft pink Queensland Leche and the fluffy Debbie Bliss Angel (for the tails, duh!). So, here are my Easter offerings -bunnies two ways: three tiny bunnies, one for each human in my household, and my "Pet the Bunny" mitten pattern. Now that I have finished my little trio, I think I will reward myself with one of those chocolate eggs in their bowl. After all, I couldn't spoil the photo op until I was finished with the knitting!